Enjoy our easy-to-find, no-pressure practice range. 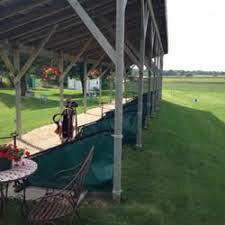 We are located in a country setting with basic practice facilities for driving, chip shots, sand bunks and a putting green. Our artificial mats are covered for misty days and extreme heat. You might also choose natural grass tee areas. We'll furnish the clubs if you need them.